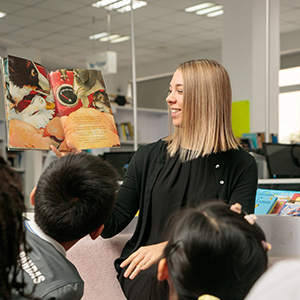 Welcome to the English Language Acquisition Program! 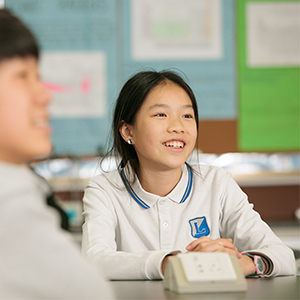 So far this year students in Language Acquisition have worked hard at developing their English comprehension and academic skills in English. 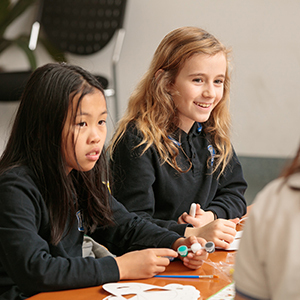 From identifying our character traits to learning about other cultures and celebrations around the world students are learning how useful, powerful and fun English can be! 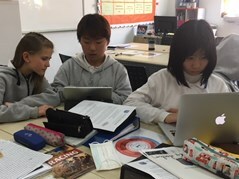 Currently, students are planning their end of the year party where they are to pick one holiday celebrated around the world and bring either a food or game to the party that will happen in a couple of weeks! The Christmas and Hanukkah celebraters are hard at work preparing and planning for their end of the year international class celebration! 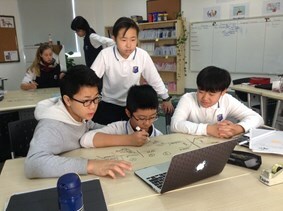 A group of grade 6 and 7’s have decided that the Holi celebration was very interesting and fun! They are planning to bring some yummy foods and hopefully a fun game for the class to play! 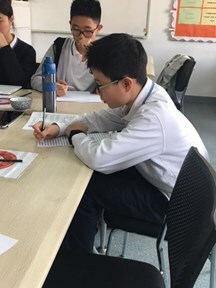 Hoyuan, grade 6, is working on his writing piece for his summative assessment. Students were asked to pick one holiday we have learned about and write a short essay on why they would like to celebrate this holiday. 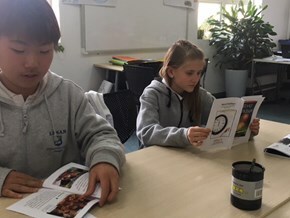 Max (grade 7) and Nella Jane (grade 6) are deeply concentrated on one of the text used this unit about cultures and celebrations around the world. 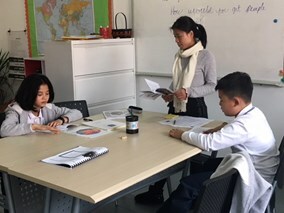 Miss Bree is hard at work with two of our grade 6 students. They are reading and learning about different celebrations around the world that will be happening in the next couple of weeks and months. 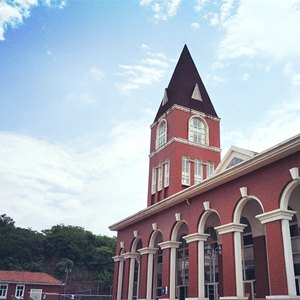 Hello from Modified Programs! In Individuals and Societies, we have been comparing and contrasting Mesopotamian and Egyptian civilizations. We are even looking at the differences between their irrigation systems! In science, we have been studying the scientific method by conducting experiments on Newton’s Laws and the properties of matter. 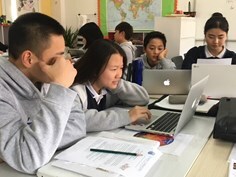 One of our most creative classes, 7th Language and Literature (Mod) we have studied the craft and structure of stories by rewriting Greek myths through a D&D game the students created. 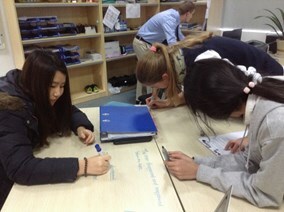 The photos below show our students trying to work out the mechanics of English sentence structures through diagramming. Look at their focus! 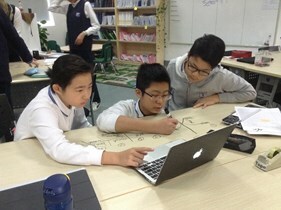 Here Kalam, YeWon, and Gesa (Grade 7) are working hard while Mr. Trowt checks emails. 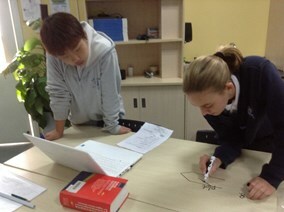 Jule and Max (Grade 7)working well together. 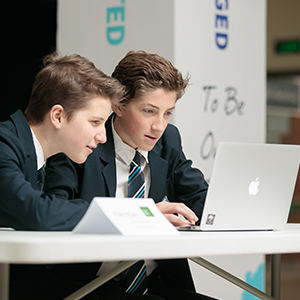 Peter and Ray are concentrating very hard, while Humfrey (Grade 7) researches on the computer. 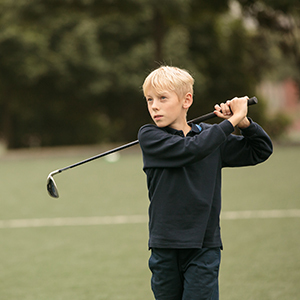 Lucia (Grade 7)decides to join in the fun!